Today we have a new Omaze video that gives us our first glimpse at the Han Solo set, including a sneak peek at a new alien creature. Last week, Disney and LucasFilm unveiled the new Force For Change initiative, which includes three separate prizes that encompass the past, present and future of the Star Wars universe, throughout the four-week campaign. The "past" campaign gives fans a chance to spend a night at the iconic Skywalker Ranch, along with a VIP tour of the Star Wars archives and a special screening of A New Hope. The lucky winner of the "present" initiative will win tickets to the world premiere of Star Wars: The Last Jedi, and the exclusive after-party, while the "future" winner will get to visit the set of Han Solo: A Star Wars story, where they'll meet directors Phil Lord and Chris Miller, take a tour of the set and get a chance to appear in the film, while one lucky grand prize winner will get all three experiences. Omaze debuted a new video today on their YouTube channel, which features beloved Star Wars icon Warwick Davis, fresh off of hosting several panels at last week's Star Wars: Celebration. The actor reveals that there is still time to donate, to win a chance to visit the Han Solo spin-off set, and that they have decided to pick yet another winner to visit the Han Solo set. Warwick Davis then reveals he's taken several photographs from around the set. But to avoid spoilers, the photos are quite innocuous, showcasing the set's parking lot, vending machines and office supplies, before featuring some special guests. Warwick Davis' slideshow is interrupted by a surprise video feed from directors Phil Lord and Chris Miller, who asked if Warwick is making his Force For Change video. When Warwick Davis informs the directors that he's giving fans a spoiler-free tour, and that they should be careful to avoid showing anything important, Phil Lord promptly moves the camera to reveal a brand new Star Wars creature, which Chris Miller is not too happy about, quickly pulling the camera away from this multi-eyed monster. While nothing is said about the new character, it certainly does have a unique look. The creature has possibly one of the most unique heads in the entire Star Wars universe, with a total of six eyes, three on each side of his face, each of which blink on its own. The character is also seen wearing a thick green trench coat with fur lining, which could indicate there are some winter scenes featured in this all new adventure. While Phil Lord was happy to show fans this creature, stating that they have a nice set and fans want to see things, Chris Miller wasn't too thrilled, asking Warwick Davis to edit that part out of his video. The set visit ends with Warwick Davis hinting that his presence on the set alone is a spoiler, indicating that he in fact does have a role in Han Solo: A Star Wars Story. This results in his face being blurred out for the remainder of the sneak peek. As most of you know, Warwick Davis made his feature film debut in Return of the Jedi as the beloved Ewok Wicket, and he has been a part of the Star Wars franchise ever since. He returned to play a number of characters in the 1999 prequel The Phantom Menace, and he also played the character Wollivan, who was one of the characters in Maz Kanata's (Lupita Nyong'o) castle in The Force Awakens. 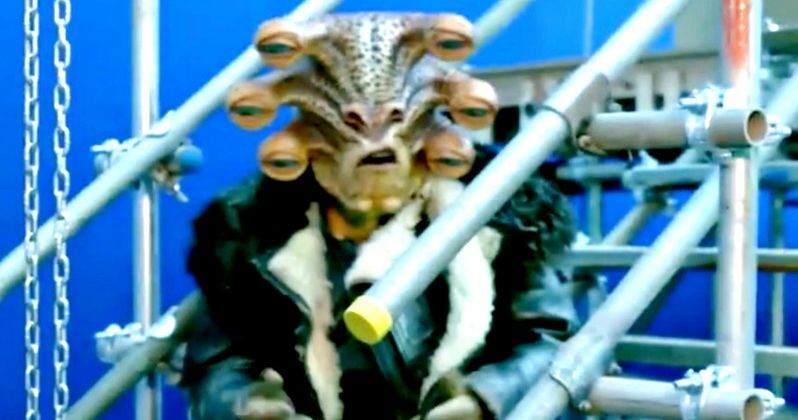 He also played Weeteef Cyubee in last year's blockbuster Rogue One: A Star Wars Story, so it shouldn't be surprising that he's returning in Han Solo: A Star Wars Story. Take a look at this new video with a sneak peek at the upcoming Han Solo movie below.